Great intranets begin with people – in fact, great intranets are obsessed with the people they serve. Technology is just an enabler. The real key to a successful intranet is people, and the process required to support not only managers, and executives, but the end user. The dedication, rigor and resources required to build and maintain a great intranet or portal are significant. And while a successful intranet does not necessarily require a lot of money per se, there are many, many facets that require attention, especially successful planning and governance. But it begins and ends with people. This complimentary, 41 page whitepaper was written by Prescient Digital Media’s CEO and Founder, Toby Ward. 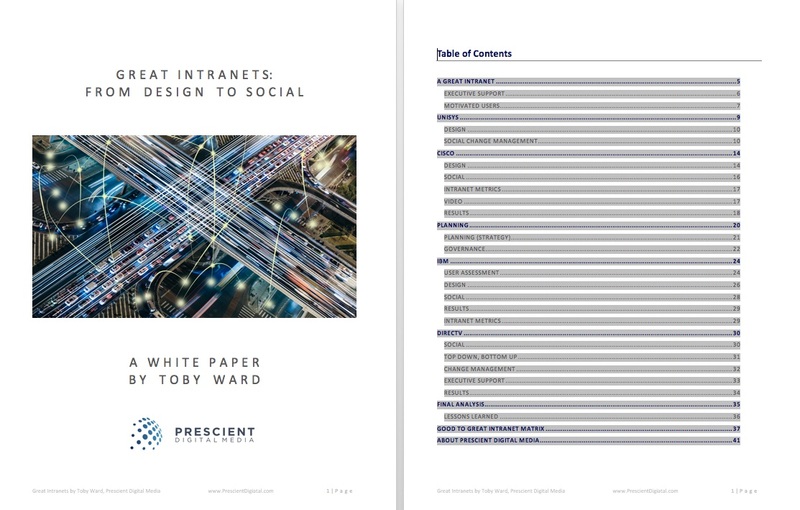 It contains numerous best practice recommendations and considerations for great social intranets.